The superior MS Paradis is a modern and classic two mast vessel showcasing authentic timber styling. The 39.3 m cruiser boasts well-appointed public areas that are perfect for relaxing and socialising, and 20 comfortable and spacious cabins offering flexible bedding configurations for up to 43 guests. There is an air-conditioned salon-restaurant with lounge bar and seating that extends outside. 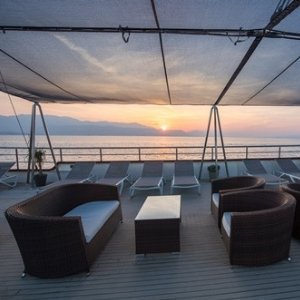 The sun deck features an outdoor bar and an ample supply of sun loungers. The swimming platform on the stern provides easy ladder access to the sea. Complimentary WiFi is also available. The MS Paradis is a modern 39.3 m cruiser. The two masted vessel flaunts classic design features and authentic timber styling. On board, guests can relax in air-conditioned cabins that are arranged over the upper, main and lower decks. The 20 en suite cabins offer flexible bedding configurations for up to 43 guests. The ship’s chic, spacious air-conditioned salon-restaurant comfortably seats all guests in a single sitting and showcases stunning panoramic views at mealtimes. The comfy lounge bar area offers extended alfresco seating. 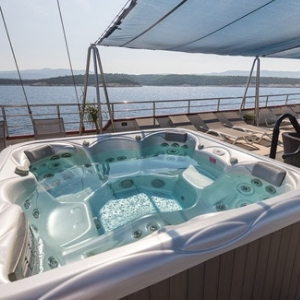 There is also a sun deck with relaxing sun loungers and a swimming platform to the rear. The 20 air-conditioned cabins are arranged over three decks, with the upper and main deck cabins offering window views. Cabins on the lower deck have portholes. All cabins boast an en suite private bathroom with shower, flat-screen TV, wardrobe, desk, in-room safe, hairdryer and a selection of complementary toiletries. The spacious and comfy environment is decorated and furnished in a modern style that features décor in elegant neutral shades and tones. The flexible double and twin bedding configurations accommodate up to 43 guests. Relaxing on board the MS Paradis is easy. The communal areas of the ship are modern, spacious and comfortable. The air-conditioned salon-restaurant features large panoramic windows so that guests never miss out on observing the magnificent views. The bar lounge area extends outside so that guests can enjoy alfresco entertaining. During scheduled swim stops the ladder on the swimming platform, located on the stern, offers direct access to the inviting turquoise sea. To top up the tan, head for the sun loungers positioned on the large sun deck.